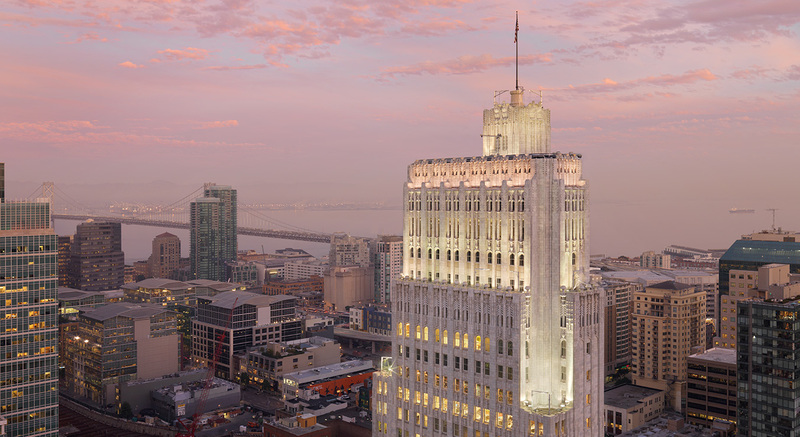 A major technology client is expanding its Silicon Valley location with a commitment to fostering a deeply sustainable workspace community. The updated campus will house 2,000 employees across two existing, repurposed, buildings that will be integrated with a new building. 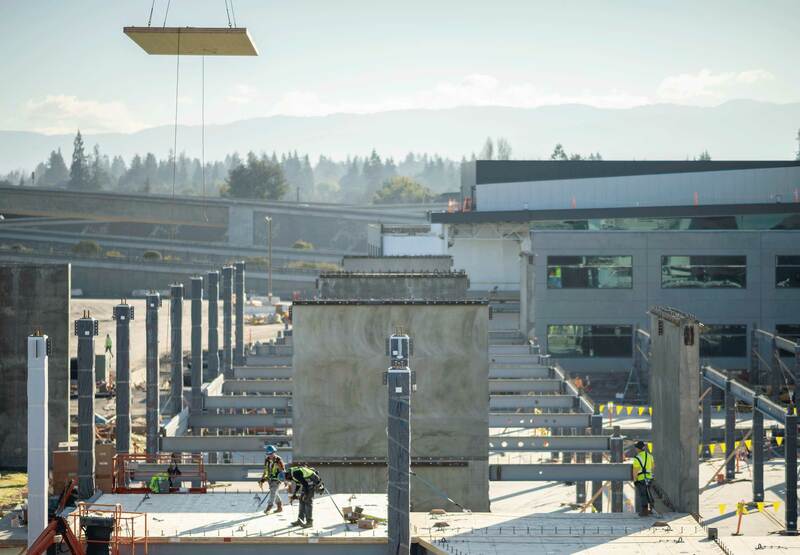 The new construction will comprise the largest mass timber building in North America—a new Cross-Laminated Timber (CLT) structure customized to meet formidable sustainability goals. This pioneering project aggressively targets LEED Platinum, Net Zero Water, and Well Building Standard certifications. 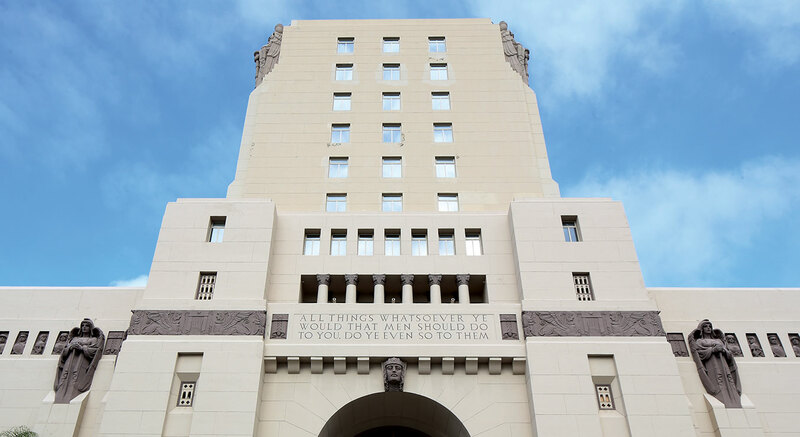 Holmes Structures provided structural engineering and Holmes Fire provided fire and life safety consulting for the project. For the new mass timber building, Cross-Laminated Timber was selected as a primary material due to its low carbon footprint and inviting aesthetic. Largely left exposed, CLT presents wood in its honest and pure form with a warm pallet of natural tones. 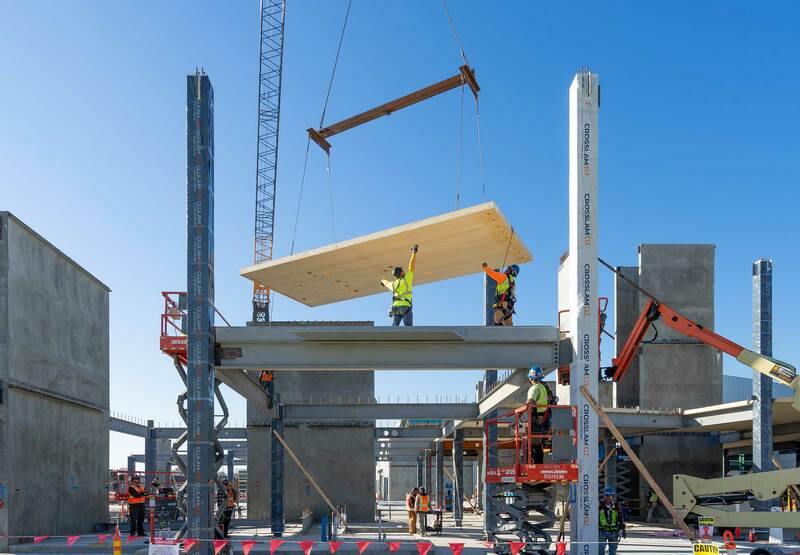 CLT also expedites construction: the design team coordinated custom panel penetrations with mass timber supplier Structurlam, allowing panels to be quickly dropped into place onsite. 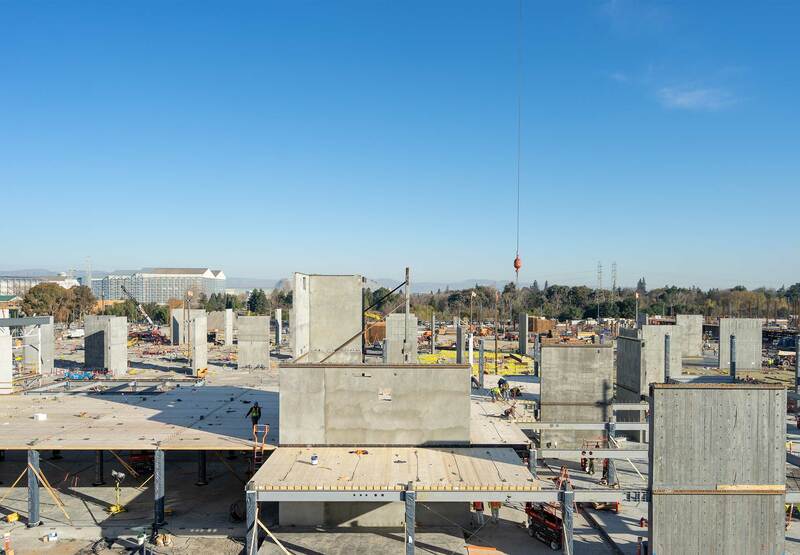 In order to support the large, contiguous floorplates that the client envisioned, Holmes Structures designed a composite CLT-Concrete slab. The composite system allows the CLT panels to span further between beams and columns, creating more open interiors. 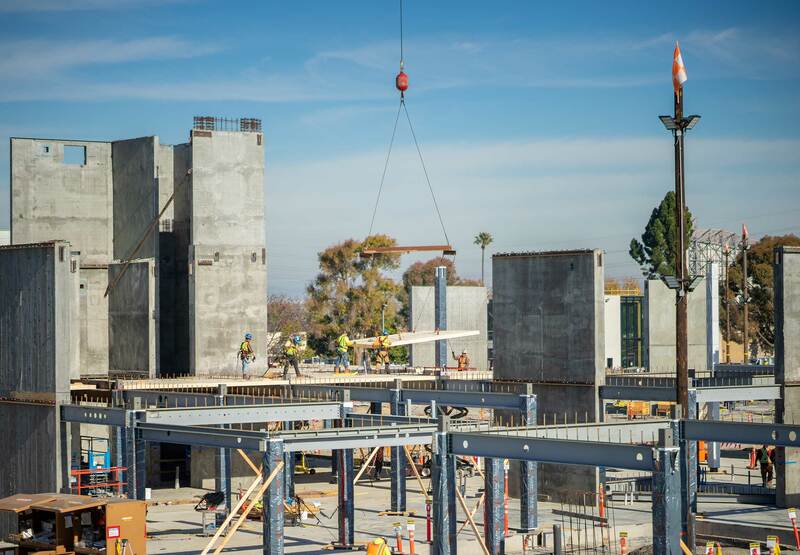 The concrete topping slab also functions as the structural diaphragm and conceals power and data systems, integrating trades into one structural solution. Since CLT is a relatively new building material in the US, this project involved considerable coordination with the local building authority to understand the performance of new mass timber technologies. This included gaining the jurisdiction’s approval of the building system in specific locations where a fire-rating was required —predominantly assembly spaces (cafes and theaters) needing fire-rated exit enclosures to protect evacuating occupants during a fire. Holmes Fire worked with WRNS to achieve fire ratings that also kept a consistent campus aesthetic of uncovered CLT and steel, exposing structural supports (beams and columns) where possible while embedding connection details within the wood. 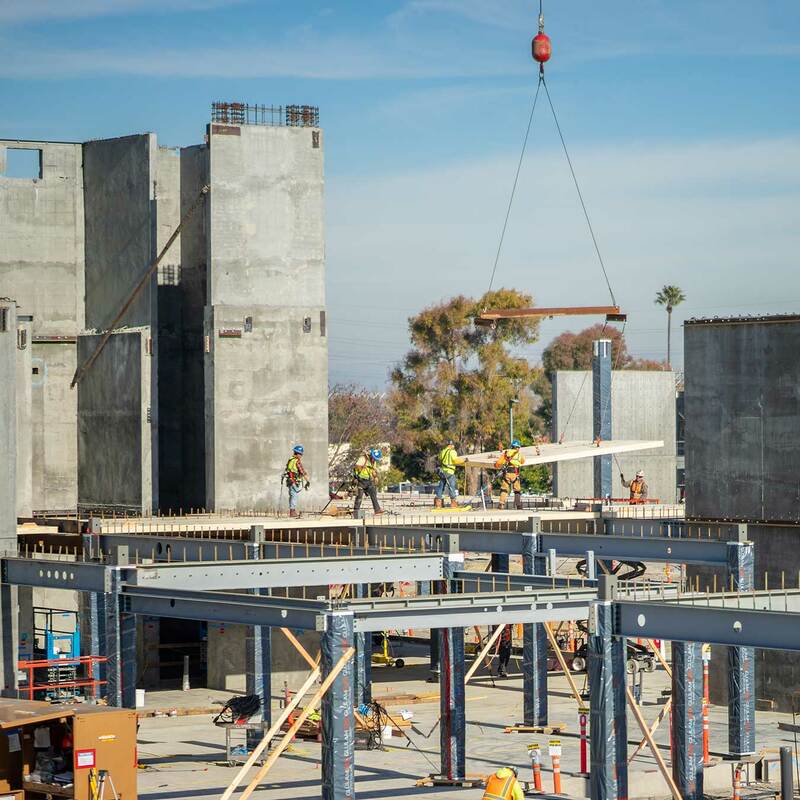 The intent of Holmes Fire’s assessment is to demonstrate that the CLT floor and glulam columns achieve a 1-hour fire rating, and that the hidden connection details also achieve a 1-hour rating without further encapsulation. Across the campus, design triggers an organic, intuitive interplay between built and natural environments. Low-lying two-story buildings complement the surrounding Stevens Creek biome without hindering expansive views of the natural scenery. Simultaneously, the campus activates new natural habitats, including a campus-wide living roof with carefully selected native and adapted plant species. Office neighborhoods are arranged around internal courtyards, providing moments of pause and outdoor tranquility. 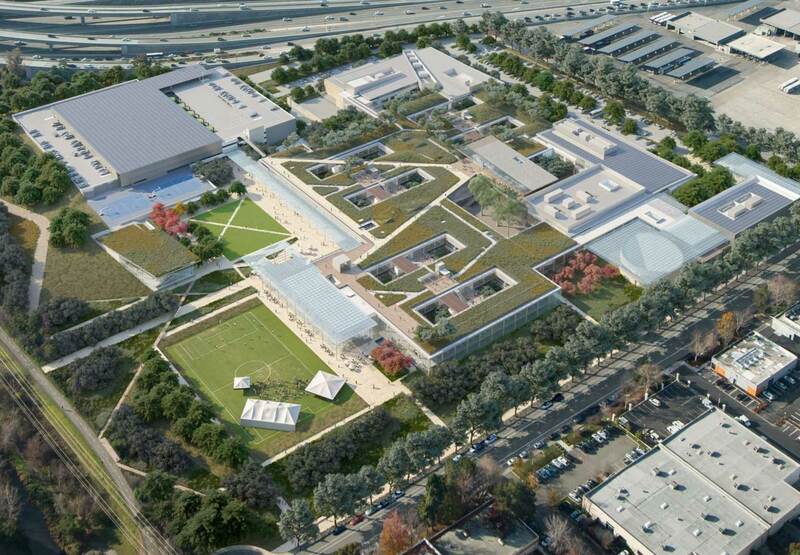 A network of pedestrian and bike trails winds throughout the grounds, encouraging a healthy and active workforce. 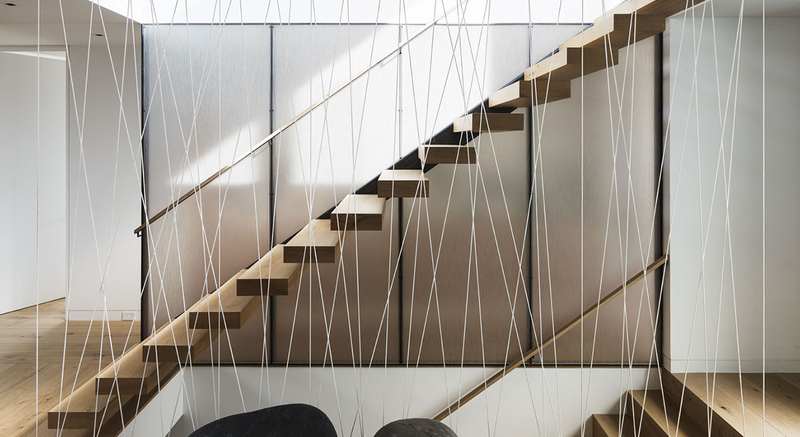 Custom outdoor staircases, rooftop decks and bridges also heighten employee mobility. Interior spaces harness natural light through abundant clerestory windows and skylights. The conscientious client sought to understand the implications of removal, rehabilitation and expansion of the existing structures onsite. 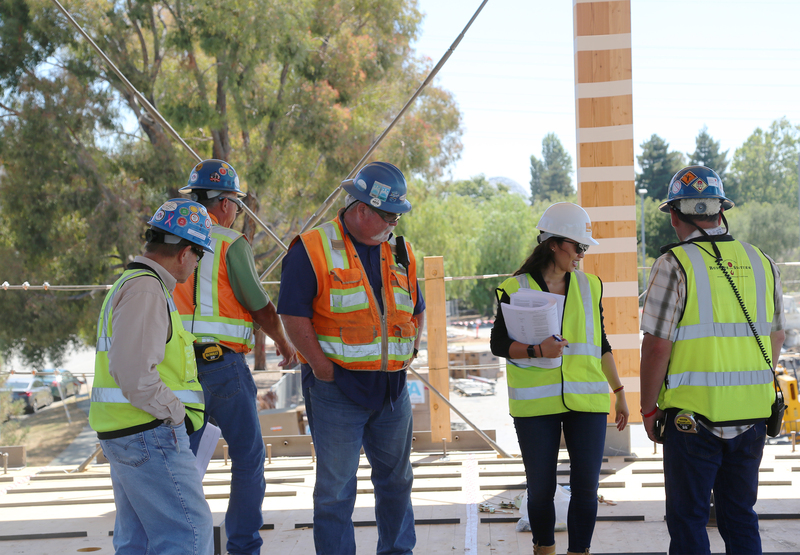 Holmes Structures explored the life cycle impacts of prospective structural systems and seismic performance objectives with the design team and client. In lieu of tearing down the entire campus and starting from square one, the client decided to give new life to two existing buildings and reduce the overall carbon impact of the project. Parts of the demolished buildings will be crushed and reused under the foundations of the new CLT structure. Solidworks models of CLT connections with exploded axons. 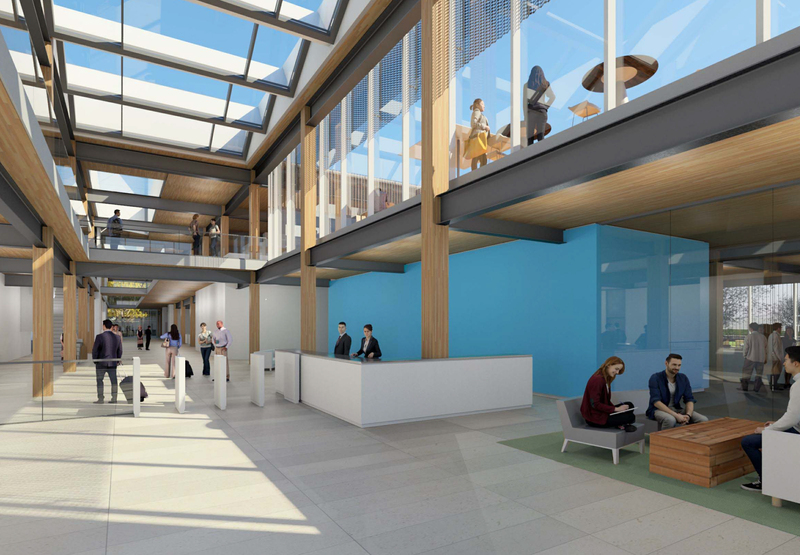 Interior rendering by WRNS features a hybrid CLT system and skylights.